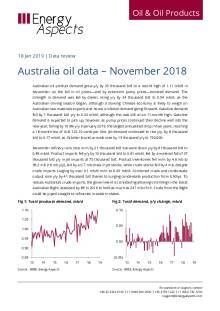 Australian oil product demand grew y/y by 25 thousand b/d to a record high of 1.11 mb/d in November, as the fall in oil prices—and by extension pump prices—boosted demand. The strength in demand was led by diesel, rising y/y by 24 thousand b/d to 0.54 mb/d, as the Australian driving season began, although a slowing Chinese economy is likely to weigh on Australian raw materials exports and hence on diesel demand going forward. Gasoline demand fell by 7 thousand b/d y/y to 0.32 mb/d, although this was still at an 11-month high. Gasoline demand is expected to pick up, however, as pump prices continued their decline well into the new year, falling by 10.6% y/y in January 2019, the largest annualised drop in two years, reaching a 16-month low of AUS 122.10 cents per litre. Jet demand continued to rise y/y, by 8 thousand b/d to 0.17 mb/d, as October tourist arrivals rose by 13 thousand y/y to 750,000. November refinery runs rose m/m by 21 thousand b/d but were down y/y by 8 thousand b/d to 0.48 mb/d. Product imports fell y/y by 10 thousand b/d to 0.61 mb/d, led by a material fall of 37 thousand b/d y/y in jet imports at 70 thousand b/d. Product inventories fell m/m by 4.6 mb to 38.2 mb (+6 mb y/y), led by a 0.7 mb draw in jet stocks, while crude stocks fell by 4 mb, despite crude imports surging by over 0.1 mb/d m/m to 0.49 mb/d. Combined crude and condensate output rose y/y by 41 thousand b/d thanks to surging condensate production from Ichthys. To reduce Australia’s crude imports, the government is considering allowing oil drilling in the Great Australian Bight, assessed by BP in 2016 to hold as much as 247 mb of oil. Crude from the Bight could be piped straight to refineries in eastern states.